We may be dating ourselves with the reference to the pool game legend but we will take the risk. You and your family have made the decision to add a beautiful pool table to your home. We applaud that and can help you find the perfect option for your family. It won’t be long before you are considered among the great pool players of all time! Buying one of these for the family rec room is a good, sound decision despite the expense of another amenity in your home. So let us help you make a good decision on which table to add to your home game room. our editor ratings are based on value, durability, and quality. **This page contains some affiliate links and GamingWeekender may be compensated if you make a purchase after clicking on the links. If you need a little help making sense of our recommendations listed up above, then let us share some of our thoughts on our favorite models on the market. Below you’ll see our editor reviews and recommendations on the best billiard tables on the market that we’ve seen so far. We share some of our top picks based on price, so if you’re shopping based on a budget, then you’ll see what we recommend as the best of the best for the price. Just keep in mind that when we reference a price, that we are basing that on what we see at time of publication on the Wayfair site only. Additionally, prices change all the time and the valid price is ALWAYS what you see at your preferred retailer. We have no control over pricing at the various retailers and can only share what we see at Wayfair at time of publication. We also share some of our favorites when it comes to the top-of-the-line premium models that have the slate playing surface for that professional billiards table experience at home. If you’re on a tight budget, or just don’t want to spend a lot on something that the kids might damage, then we suggest sticking to models with a price under $1000, but if you have a bit of wiggle room there are some great models under $1500 and $2000. Some of the top pool table brands that have model which meet this price range include Playcraft, Fat Cat, and Barrington Billiards. While there is no doubt that you get what you pay for, we have still managed to find some decent models that meet this price range (while there are awesome premium tables with a price over $3000). But do keep in mind that prices for these models can vary by retailer, and the price you see listed by the retailer is the current, valid price regardless of what you read here or elsewhere. This model right here gets our pick for the best cheap pool table for the budget-minded. It is made by a well-known brand who has a reputation for making quality tables at affordable prices. Of course, Barrington has plenty of models that exceed this price range, which lets you know that they do deliver quality products. It is slightly smaller than your standard full size table at 7-foot in length, however this makes it an ideal pool table for smaller rooms. The surface features a scratch-resistant finish to protect it from any damage inflicted by the pool cues. 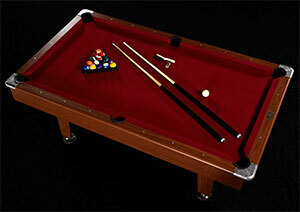 The table surface is level and the polyester velvet keeps the balls rolling easily and smoothly during game play. The bumper guards seem to be quality for the price and work as intended. Since this is not a slate table, it weighs less than 200 pounds at around 172 pounds total (so you will likely need a friend to help you assemble it). So yes, it is a quality MDF pool table. The ball catching nets on this one are really more of a cheap polyester fabric bag, but for the money it’s not that bad. It definitely doesn’t have that high-end leather pocket look like you get with more expensive billiard tables. A nice feature of this one is that it comes with an accessories kit that includes the balls, a rack, a brush, two chalks, and two cue sticks. Basically, you have everything that you need to start playing as soon as you get it assembled. Just keep in mind that the included cues aren’t great and you’ll likely want to upgrade those at some point in the future. If you’re looking for the best full-size pool table at an affordable cost, then we recommend you check out this 8-foot table from Barrington. As you can tell from the photo, this model has a much more luxury look to it with the claw leg design. So, if you want a high-end feel at a cheaper cost, this is your best bet. As you’ll notice, it’s not just those claw feet that makes this model one of the best pool tables for your living room. The playing surface is made of a 50% wool blend, that gives you a more premium feel, and you’ll notice it when you’re playing a game. The feet, top rails, and the sides of this model are composed of solid wood, which not only means that this is a very durable pool table, but also slightly heavier than most cheap models. It weights around 260 pounds, so definitely have someone to help you assemble it! We really like that the ball pockets are professional-style drop pockets made of a faux leather that gives it that luxury, high-end look that you find with the more expensive models on the market. 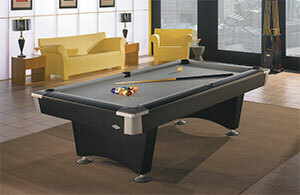 This is definitely the best high quality pool table with a low price. It’s one that you won’t mind having in the living room for your guests to see because it is really a signature piece of furniture that you will be proud of. And, it’s high quality should last your family for many years to come. This model also comes with the same accessories package at the 7-foot table reviewed above. If you’re looking to get the best that money can buy, then you need to get yourself a billiards table that has a slate playing surface. Slate pool tables are what the professionals play on and they are what you want if you’re going for luxury or professional options for use in your home. Technically you could put any of these models in your office break room, in a bar, or other business, but we are focusing on the home pool player. Keep in mind that slate tables typically have a higher price tag since they use more quality components than other models. This means that they are also a lot heavier and typically take around four adults to move around. Fortunately, Wayfair delivers most slate pool tables for free, which is why they are our #1 recommended store for free delivery of slate pool tables. Though Playcraft is primarily known for making cheaper MDF tables, this Charles River model is an excellent choice if you’re shopping for a cheap slate pool table. The quality is good and the price is under $3000. In fact, we think that this is the best slate pool table under $3000 right now. This model has those attractive claw legs, which makes it a great signature piece for whatever room you put it in. It also features leather drop pockets for catching the balls when you make a shot. It is a full-size standard table, so make sure that you have enough space in whatever room you want to put this baby in. If you’re trying to match the table to the rest of your furniture, then you’ll like that you can order this one is a dark espresso finish or a warm chestnut finish. And remember, the slate surface makes it heavy, with this one weighing it at around 700 pounds! Unlike the cheaper models above, you do not get any accessories with this model. So, you’ll need to get your cues, etc. on your own if you want to be able to play as soon as it arrives at your home with free shipping from Wayfair. If you want a good slate pool table with a more contemporary design, then this model from Brunswick Billiards is an awesome choice. Before you shop, do know that this table seems to have two different names! Some retailers are calling it the Brunswick Black Wolf Pool Table, while others are calling it the Brunswick Boca Pool Table. However, the two names seem to refer to the same table. This one is also just as heavy as the model listed above. The main differences here is that you have a different design and you get an accessories package with this one. The included accessories are fine, but I think you’ll want to get your own cues, etc. so that you can get more high quality options. So really, the only reason to choose this more expensive model is for the more modern, contemporary design. If the current furniture in your home is modern, then this is likely to fit in better. If you’re shopping for a bar, other business, or just want something that looks commercial in your home, then you’ll need to check out the 9-foot commercial pool tables. Some of these are coin-operated. And most of them have a ball return system built into the table. We’ve checked out the options on the market and can recommend the table below as our top pick. This right here is your top of the line, heavy duty, high quality commercial pool table. And it comes in two different finishes – a deep mahogany or black. It’s got a nice, stylish design and a slate playing surface. The materials are durable and should last for plenty of years to come. 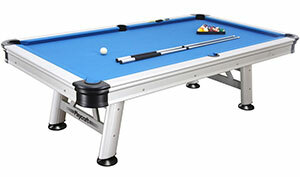 And it’s one of the best pool table with ball return models on the market. With internal slate leveling, lazy susan foot leveling and extreme hardware, the Gold Crown V model offers supreme play performance for the discerning player with stylish looks and timeless and design. Due to it’s bigger size, you’ll need to make sure that you have plenty of room for it. The suggested room size for this one is: 14′ W x 18′ D. And yes, it does come with a decent set of accessories to get you playing immediately. Just don’t plan on trying to move this thing by yourself since it weighs around 1250 pounds! If you’re short on space, then you might be interested in pool tables that convert into dining room tables. This way, you have one piece of big furniture that serves multiple purposes. Fortunately, you can get one of these for an affordable cost – and the best part is that it is really a combination game table because it also converts into a ping pong table! This model from Hathaway is a great choice because it has multiple uses. But first, note that it’s size is slightly smaller than your standard full-size table. We like that this model has a nice rustic, reclaimed wood look to it, even though it is made of sturdy MDF. And you can quickly and easily convert it from a dining or a craft table to a full competitive table tennis or pool table. 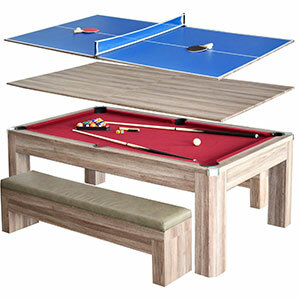 It comes with matching padded benches that also function as storage space for your table game accessories. Just lift the seat to reveal a nice hidden storage compartment. It does include some accessories, and the table playing surface is a wool and polyester blend. Overall, this one is a great choice for families who need a multi-purpose gaming table that converts into a kitchen table. If you want to take your billiards experience outside, then you can find a few different outdoor models on the market. These are typically designed to withstand all the harsh weather elements, but you can extend the table’s life by using an outdoor cover with it. We find that these tables are ideal for people who live in warmer climates, as well as people who have a lot of kids, friends, or family who spend a lot of time outside. After comparing a few models, we think that this is the best outdoor pool table for the money right now. Though, like most outdoor gaming tables, it probably a higher price that you’re expecting. Fortunately, it is built to last so we think that you money will be well spent on it. It is made of aluminum to withstand the weather outside and the playing surface is UV resistant to protect from sun damage. Don’t worry about moisture damaging it because it does arrive with an anti-rust coating on the exterior. Included is an accessories package that does have a cover for you to use on the table when it is not in use. It is definitely a good idea to keep this thing covered when you’re not using it cause you don’t want any dirt or other debris to build up on the playing surface. Also note that it does have leg levelers so you can put it on uneven ground just fine. And remember to bring your accessories (cues, etc.) inside when you’re not playing because they are not weatherproof! There are a couple of variations on the game of pool which are worthy to keep in mind as you go out to begin your shopping. Pool is a broad term that most people identify all billiard games with. However some of the other games such as snooker, and carom billiards have different rules of play. For your pool playing purposes you need to know this since these other cue games have different tables as well. That is what you are in the market for – a pool table. Cue Games is the broad umbrella of a term that refers to all games played on a large welled table using a cue stick. Not only can your shopping yield a table with a napped bedcloth but the cloth may have grooves to guide the balls. Nothing slick and smooth about it Depending upon the game, the balls may be of different sizes as well. 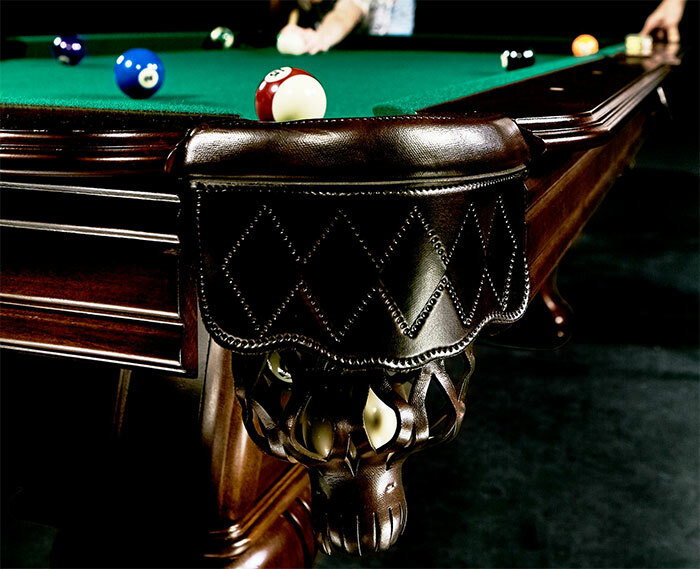 Carom billiards – These tables are typically ten feet in length. This game is played without pockets. Snooker – We’ve all heard the term, “you’ve been snookered, or don’t get snookered. Snooker refers to a recent recruit to the military. It is also a billiards game that is played on a 12 foot by 6 foot table. Pool – Refers to the games that most people think of when you hear the term. Again there are several pool games that you have the rest of your days to learn all about. 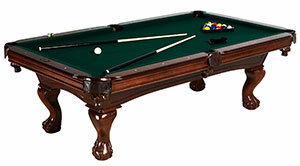 For the purpose of buying your pool table the general size is 7, 8 or 9 feet., with seven feet being the most popular. This guide is designed for assistance with the purchase of a standard pool table (which is 7-foot long, has a green playing surface and is commonly referred to as an American Pool Table). Keep reading to get a full outline of all of the parts of a standard pool table so you won’t be behind the 8-ball. We understand why you made the decision since pool is an easy-to-do recreation that doesn’t take too much of an investment of your time to become quite good at. There are so many positive things to say about the game and your decision to add a quality table to your home. Instead of boring you with what you already know we will craft this guide along the lines of assisting you in finding the right table for you and your family. Sounds simple right – just measure the room. When it comes to buying the right size it is important to add space for the players stance. Try not to laugh but it is a good idea to find the tallest person you know – have him or her come over to your home and have them pretend they are playing pool at a particular mark you designate. Some players really like to get eye level with their ball and that requires a significant amount of bending and extension. This translates to extra square footage that you have to take into account. Set up the rectangular markings of a standard pool table in tape on the floor where the pool table will be housed – then have your tall model come over and actually assume the postures of someone playing pool. Measure their extension. You want to make certain that there is ample space to have not only the pool table but you need room for the players to flex and make the best possible shots. That’s part of the fun. The last thing you want to do is have a beautiful table set up at your home and no one over 5 foot can play without bumping into a wall. Is the pool table going to be part of a larger recreational space in your home or is there going to be one room designated for it? Is the floor sturdy enough to support the weight of the pool table you are considering? Can the area also house accessories? Pool table tops are typically made either of slate or MDF. So, if you’re curious about slate vs wood pool tables, we can break down the differences for you. Experts assert that the slate tables, though much more expensive and heavier lend themselves well to better play. The balls move more freely with the slate pool table top and they are nearly indestructible. Slate tables are generally constructed with more than one piece of slate. The slate slabs are joined together by a resin composite which produces a seamless surface. Better construction costs more money and it also produces higher quality table tops. Spend a good deal of time researching this facet of your purchase. 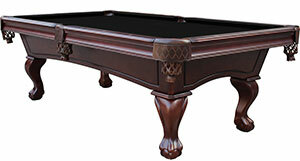 The table top material and workmanship will lend considerable value to your pool table. Ask the salesperson or pool table dealer if you can see a model or work up of the table before the bedcloth is applied. MDF (medium density fiberboard) table tops are constructed of wood fiber board and are at risk to warp over time with moisture in the air. This is considered a more economically feasible alternative to the slate. Other economically feasible alternatives include plywood and plastic. It really depends on what level of play you need for your home. If you want a small table for the kids to play on as part of their rec room, your requirements are going to be much smaller than if you plan to make this the center of a lavish man cave. Some enthusiasts like to get the most usage out of their table. To answer every need there is such a thing as a pool/dining table or a dining conversion table. This serves both functions by having removable parts when you want to use the table for other uses or when you want to dine on the table. As with any amenity purchase it is possible to have custom features added to your pool table to make it a stunning addition to your decor with felt bedcloth and rail finishes to complement just about any designer finishes. Pool tables do not depreciate in value and if they are well taken care of chances are you will get what you have paid for the table or more – it is a wise investment. 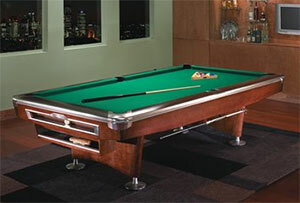 People often employ a professional pool table installer to make certain the table is set up appropriately. Undoubtedly this will add to the expense of the purchase. You will also have to consider if you will have room for the table if you and your family plan a move. Pool tables get passed down from generation to generation at times but remember it is such a large heirloom. Before buying have your home inspected to make sure there are no leaning floors or other structural problems that will be detrimental to your pool playing. You can have the best of both worlds and have a great playing table that also makes a grand statement and sincere nod to the tradition of the past time while looking spectacular. Be cognizant of what you want to get out of the table as well as what you want to put into it. Now that you know a little more about pool tables we are certain you won’t get snookered when you go out to make your purchase. We are just as sure that you and your family will enjoy the pool table for many years to come.